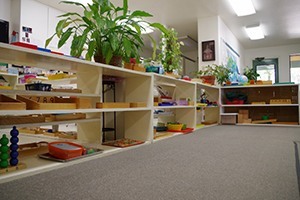 A Montessori classroom allows children to engage in activities that are geared toward helping them develop their cognitive, social, emotional, and physical skills. Children are challenged as individuals and are allowed to work at their own pace. Montessori education develops capable learners who not only know how to learn and solve problems, but who also love to learn. 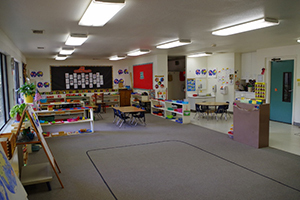 Children work in multi-age classrooms as individuals and in small and large groups. They are challenged to be independent as they explore a wide variety of subjects using specially-designed materials to teach specific skills. From birth through approximately age 6, the young child experiences a period of intense mental activity that allows her to "absorb" learning from her environment without conscious effort, naturally and spontaneously. Children are quite capable of absorbing concepts and skills, even if they aren't yet ready to express them. The sensitive periods are a period of time when a child's brain tells him to focus on mastering a specific skill, milestone or experience. Children who are able to satisfy their urge to focus on learning during a sensitive period (be it learning to stand, adding three-digit numerals, or watching chickens eat breakfast) experience a noticeable satisfaction. Maria Montessori observed that when a work was completed, children were rested and pleased with themselves. This satisfaction led the children to show their best selves, which she found to be a compelling reason to let children work freely. The time period for each sensitive period is different for each child and lasts for a time unique to each child. All children pass through the sensitive periods at some point and there is little that we adults can do to affect it (given that the child is in a normal environment free of malnutrition, disease, abuse, or neglect). However, there is much that adults can do to provide the adequate learning environment for the child. 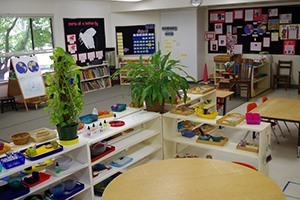 The Montessori environment is prepared with carefully-selected aesthetically-arranged materials that are presented sequentially to meet the developmental needs of the child. 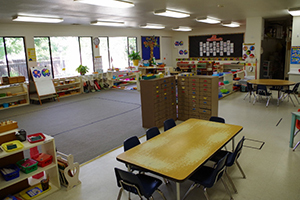 This includes appropriately sized furniture, a full complement of Montessori materials, and enough space to allow children to work in peace, alone or in small or large groups. Beyond the physical arrangement of the classroom, the adults within must also prepare themselves to allow the child the best possibility of fulfilling the learning that they must do. This includes giving the child support, freedom of choice, and respect. These preparations appeals to the child's sense of order and peace, which are essential to a productive learning environment. Practical Life is the Montessori term that encompasses domestic work to maintain the home and classroom environment: self-care and personal hygiene; and grace and courtesy. Practical life skills are of great interest to young children and form the basis of later abstract learning. 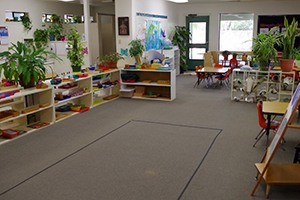 Young children in Montessori classrooms learn to take care of themselves and their environment through activities such as hand washing, dusting, and mopping. Grace and courtesy lessons might include how to introduce a friend, excuse oneself, or apologize. These activities help young children learn to work independently, develop concentration, and prepare for later work with reading and math. Older children participate in more advanced activities. These activities are designed to develop and refine the 5 senses:seeing, hearing, touching, tasting, and smelling-and build a foundation for speech, writing, and math through the use of sensorial materials. The exercises prepare the child for accurate perception of details and attributes and help them to bring order to the world around them. Spoken language is emphasized as the foundation for linguistic expression. Because of this, teachers use exact vocabulary for all activities. 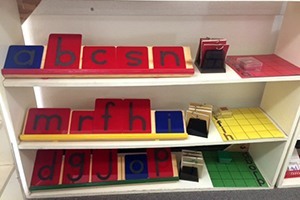 Materials are available to help the child make connections on their own, with the guidance of the teacher. Language lessons help children to develop speech, handwriting, spelling, grammar, vocabulary and composition skills. Children are also exposed to a wide range of books and literature, allowing them to explore a love of reading and reading to learn. Maria Montessori believed that children first must understand the concrete world before they can grasp the abstract world. Montessori Math materials are built to show children, in a hands-on way, the concepts related to numbers, operations, geometry, measurement, algebraic concepts and problem-solving. The materials are painstakingly organized in increasing complexity, and the lessons taught alongside them are carefully driven at specific skills that build toward abstraction. This includes biology, physical science, history, geography, cosmology, and art. Children are naturally attracted to learn with the cultural materials and real images presented through stories and experiences. 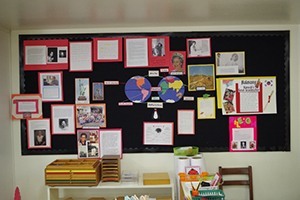 These subject areas are often integrated into literature, math, and writing.